The seventh Boeing C-17A Globemaster for the RAAF arrived on delivery at Amberley on Wednesday. Australia’s acquisition of two additional C-17s, taking the fleet to eight, was confirmed in April, and A41-213’s arrival at RAAF Base Amberley marks the fastest delivery of an Australian C-17, Defence Minister Kevin Andrews said in statement. The eighth aircraft is due to be delivered by the end of the year. “This latest acquisition will bolster our existing fleet of strategic lift aircraft – providing vital heavy airlift support to a range of operations, and increase our capacity to provide swift disaster relief and humanitarian assistance at home and abroad,” Chief of Air Force Air Marshal Leo Davies said. Boeing is in the process of shutting down its Long Beach, California C-17 final assembly line with work on the 279th and last C-17 now largely complete. The seventh and eighth Australian C-17s are being acquired from a final batch of 10 Boeing built as ‘white tails’ – aircraft built without a customer – only one of which now remains unsold. Maybe we should follow the RNZAF (9 NH90 TTH) in acquiring the last C17A ER White Tail as a source of spares and bare fuselage to phoenix airframes 1 to 8 should some catastrophic event occur over the next 3 decades of RAAF service? I still think we should get an additional 2 and make it 10 all up. Also the KC 30 fleet should also be 10….just saying! Wow, fast! Seems like they’ve only just been ordered and it’s landed already! Wonder who will get the lucky last? Hopefully the DWP says we should have more and #279 is already earmarked for the RAAF! @TimC69, there aren’t 2 more to get, after Qatar’s big top-up order, there’s only 1 ‘white-tail’ left. @adammudhen thanks for the update, let’s at least grab the last one. A great asset for the ADF. Why would we spend the many 100’s of millions of dollars on the 9th airframe and only use it as a source of spare parts? Seriously don’t understand why you would suggest that. Yes I can understand why NZ would obtain an extra NH90 airframe (probably only 10’s of millions) as a potential source of spares, but that says a lot more about the ability, or should I say ‘lack of ability’, by NHI to provide appropriate levels of spares inventory and support for the ‘global’ NH90/MRH90 fleets. On the other hand the RAAF is part of the global C-17 Sustainment Program which supports the USAF, RAAF and a lot (if not all) of the other C-17 operators, and it appears to do so very very effectively too. In normal operations and sustainment, year in year out, I’m sure that Boeing and its partners will be keeping the global C-17 fleet operational for many decades to come. As far as a ‘catastrophic event’ occurring, as you have suggested, short of a total ‘write off’ of the airframe, Boeing has proven itself in putting four significantly damaged C-17A’s back into service (if you want to go and have a look at the C-17 Wiki page, it lists “accidents and notable incidents” near the bottom of the page, you will see the details). Anyway, great to see No 7 now in service and looking forward to No 8 arriving by years end, and ‘if’ we do end up with the last white tail, then I’d be more than happy to see ‘all’ nine in active service, spread the wear and tear around a larger pool, for the many decades of valuable service they will provide the RAAF and the ADF!! It would be safe to assume 1 remaining would be for an existing customer. Not the sort of thing to only have 1 off in a fleet economics alone. Perhaps Canada might (they recently gained their 5th) though they seem to be restricted as most countries are financially not that well off. Having a total here of 9 would still be good. Obviously a remarkable resource which Australia is very fortunate to have going forth. A smarter move would be to encourage the RNZAF to acquire a C17ER (or 2) for its strategic airlift requirements (they have been looking at the aircraft), perhaps operating it in partnership with the RAAF but with NZ aircrews even basing it in Amberley but with prioritisation set aside for NZ defence Force and NZ Government taskings . The ladt airframe #279 is a usaf airframe. My first preference is for a 9th Operational C17A ER in RAAF service. The purchase price is only one component of costs during its life. The ANAO has criticised the ADF and DMO for using 1/3 Acquisition, 1/3 Operations and 1/3 Maintenance / Upgrading cost budgeting for not reflecting real through life costs. Operations and Maint/Up funding may be reconsidered as regional tensions increase. The ANAO report on the Taipan said Acquisition Cost A$65M per helicopter. Up to another A$10M each may be required to remedy shortcomings. Hence each C17A ER cost 3 – 4 Taipans. The Taipan supply chain shortcomings are noted. Our 9th C17A ER would be cheaper than the sum of its parts which could be listed as spares on the Amberley flightline available immediately. When Boeing supply chain parts arrive they could be refitted to 9. The RAAF has not lost any of the 48 A, E, H or J30 Hercules in service. Some J30s were damaged by hail at Richmond. A large number of the ~29 Caribous were written off operating into forward airstrips like the C17A ER is designed too. Granted the 10 C27Js are more at risk. 1 B707 crashed during asymmetric engine training. 1 C model Chinook was written off in RAAF service. 2 more Army D models in Afghanistan. 1 Orion ditched near Cocos Is because weather conditions precluded a safe landing. So loss of an airframe operating during the monsoon is not unrealistic but hopefully will not happen. Not to mention an enemy action. Unfortunately the C17A ER cockpit does not have a civilian CCQ like the E7A and P8A to 737-7/8/9 that would allow civilian crews to be utilised without extensive type training and currency in emergencies. The C17 production line in unlikely to be reopened after 279 hence my suggestion. A 9th and 10th C-17 sure would have been cool to have for the RAAF but is there demand for these aircraft, even taking into account increasing maintenance down time in future? If the RAAF was told “Here is some spare $XXXmillion. Go and look at your current and likely future airlift tasking, decide where there is the biggest gap or where there is most likely going to be future gaps and then buy the appropriate platforms” would they buy extra C-17s, C-130s, KC-30s, C-27s or even more CH-47s for the Army? That is really the most important factor. After all like many things in the ADF, airlift is a mission and not a platform. It would be awesome if Australia could by a 9th brand new C-17 and the last one ever built. It would also be good for Australia to buy an additional 3 second hand C-17s form the US Air Force with low flight houses and cycles along with being built within the last 5 years. 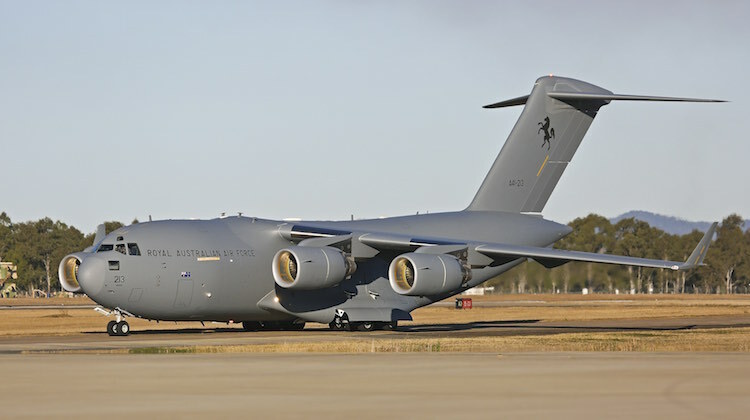 If Australia could buy second hand C-17s from the US it could be good if we could capitalize on it and expand the fleet to be the second largest in the world with 24-36 C-17s. Yes it might be a large fleet but it would allow the Australian government to respond to anything within 24 hours with tremendous capability transporting goods such as humanitarian aid and heavy construction machinery to help with rebuilding countries to transporting tanks and other military equipment to war zones. The RAAF should also buy and additional 12-24 EA-18G Growlers along with and additional 12 Boeing F/A-18F Super Hornets and 24-36 F/A-18E model aircraft with the whole Super Hornet fleet converted into Advanced Super Hornets. The RAAF should take up all 4 options they have for the P-8a’s along with adding 5 KC-30s to the 7 KC-30s Australia has (5 in service 2 being converted). The government should also buy 2-3 Airbus ACJ-330-200 with the KC-30 refuelling receiver and counter measure sweat or 2 Boeing BBJ 747-8I for the Prime Minister and then have 2 Boeing BBJ 2 aircraft and 3 Bombardier Global 7000/8000 aircraft all which would have secure communication equipment. Vote 1 – Corey for Defence Minister ??? 2 x BBJ 747 8Is ? One for the PM and one for Bronwyn ……. Seriously mate, how many times have I said not so much of the Red Cordial? You have to water it down, don’t drink it straight, and don’t scull it with Red Bull either, ok?? A 9th C-17A? Yes still possible (probably not going to happen, but still possible), 3 second hand C-17A’s form the USAF? (never going to happen!) Expand the C-17 fleet to 24-36? (What the!!!) Mate, now that really is a Red Cordial moment! Corey, I’ve said this to you before, there are ‘no’ second hand C-17A’s available, simple as that, they are a strategic asset for the US Government and the USAF, they aren’t going to be making any available any time soon, ok? Even ‘if’, because of US Defence Budget issues/cuts, the USAF was forced to ‘park’ a number of C-17A’s, they would firstly end up as a source of spares for the rest of the USAF fleet, but that’s not going to happen either, ok? Corey also said: “An additional 12-24 EA-18G Growlers along with an additional 12 Boeing F/A-18F Super Hornets and 24-36 F/A-18E model aircraft with the whole Super Hornet fleet converted into Advanced Super Hornets”, mate, again, are you serious???? Why do we need more Super Hornets? Haven’t you noticed that there are currently 72 F-35A’s on order? (and the potential for another up to 28 in the future), And do we really need any more Growlers either? Don’t forget that somewhere down the track the F-35A”s will also be capable of carrying the Next Generation Jammer, and it will be able to do that ‘without’ any specialised airframe modifications to do that task, again, not going to happen and not necessary either. And don’t forget the so called Advanced Super Hornet ‘only’ exists on paper, it’s not a ‘real’ aircraft, ok? Most Western nations, in recent years, have significantly cut the number of combat aircraft available, Australia on the other hand will actually be increasing the size and capability of the combat aircraft fleet, isn’t that enough?? I think it is. As for another 5 KC-30s, 2-3 Airbus ACJ-330-200, 2 Boeing BBJ 747-8I, 2 Boeing BBJ 2 aircraft and 3 Bombardier Global 7000/8000, again, never never going to happen! It’s great that you are so enthusiastic about the RAAF, but you seriously need to ‘balance’ all of that up with reality and also the extreme cost of all that you propose, ok? Anyway Corey, I await your next Red Cordial moment!!! “Only one C17 remains unsold”…we shall see. We haven’t been told who has bought the others. 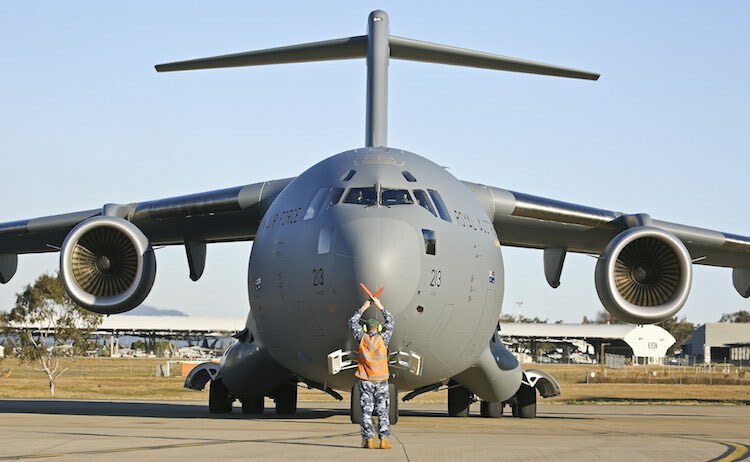 According to Janes, the Australian Government set aside $1.6 billion to acquire 4 new C17. We shall see what announcements are made in the August White Paper. Actually it has been reported numerous times where the nine (9) ‘Sold’ white tails are going: 4 Qatar, 2 UAE, 2 Australia, 1 Canada. That leaves one (1) airframe reportedly still available. … and re. the RAAF VIP fleet: I haven’t seen anything yet (maybe the DWP will provide some clarity), however I understand that the lease period is coming to an end (delivered 2002 for a 13 year lease) and a decision will need to be made sometime soon if it hasn’t already (unless perhaps the lease is extended?) As additional KC-30’s have been ordered, this may be more a case of what replaces the Challenger 604 as opposed to the 737 BBJ. The VIP/SPA fleet lease has been extended until mid-late 2017, and there are options to extend it further if necessary. Actually I still stand by what I said about the Advanced Super Hornet, the so called Conformal Fuel Tanks on the test airframe that Boeing produced (using a modified Super Hornet), were in fact basically ‘dummies”, empty shells and weren’t actually ‘plumbed’ into the airframes fuel system. And I’m not even sure if all the other modifications are/were ‘production’ ready either. Yes the test aircraft was ‘aerodynamically’ representative of what an ASH would look and fly like, but that is still a long long way from being a product that could be ready to be ordered and start rolling off the Boeing production line, someone somewhere will have to pay for all the R&D costs. Realistically the only chance, and I mean the only chance, of the ASH or even components of the ASH, such as the CFT’s, being introduced as an upgrade to the RAAF’s Super Hornets and Growlers is if the USN actually does that first, and if they don’t, we won’t. The RAAF has made it very clear that our airframes will be kept to the identical configuration of the USN’s airframes. The Orion didn’t ditch at Cocos Is.land, it crashed. It ripped it’s leading edges off pulling high g’s, couldn’t maintain lift, and ended up in the lagoon. I don’t thing acquiring the 9th unsold C17 would serve any purpose as spare parts, Chris G. The US Air Force has over 2oo C17s and they all go in for scheduled 2 month rebuilds. So while no more aircraft are being produced, the components suppliers will be no doubt busy producing replacements and spares for the next 20 years at least..
Why don’t we just bite the bullet, and race down to AMARC (?) near Tucson AZ, and grab 10 or so C-5’s at a third the price. Last time there I saw heaps of them lazing in the desert. Just kidding. Try and recall 15 or so years ago when we had zero C-17’s, how did we handle defence, and disasters? Yep, you’ll say the C-130, or Boo, but we also chartered large frames to move quantity quickly. So 8 C-17’s saves us those problems, and puts us up there with the “Big Boys”.